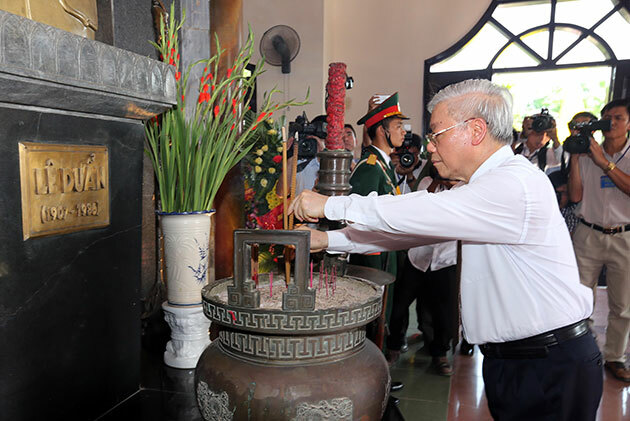 Party and State leaders and authorities of central Quang Tri province paid tribute to late Party General Secretary Le Duan at a monument dedicated to him in Trieu Thanh commune, Trieu Phong district on April 6, on the occasion of the leader’s 110th birthday anniversary. The delegation included Party General Secretary Nguyen Phu Trong, former Party General Secretary Nong Duc Manh, former President Truong Tan Sang, and Deputy Prime Minister Truong Hoa Binh, among others. After the incense offering ceremony, the leaders visited the commemorative house and recalled the revolutionary life and career of the late Party chief through displayed photos, documents and objects. Le Duan, real name Le Van Nhuan, was born on April 7, 1907 in Bich La village, Trieu Dong commune, Quang Tri province’s Trieu Phong district. He was the Party’s First Secretary and then the Party General Secretary from 1960 to 1986. His leadership helped the Party to successfully guide the people to carry out revolutionary missions in both the North and South of the country, contributing to the country’s victory in the resistance war against the US in 1975, as well as national construction and defence after that. On this occasion, Party General Secretary Nguyen Phu Trong had a talk with residents in Trieu Thanh commune. He also visited and presented gifts to several policy-beneficiary families in Hau Kien village. On the same day, the leader paid homage to martyrs at the Quang Tri Ancient Citadel. During the fierce 81-day battle in 1972, thousands of soldiers and people laid down their lives to protect the citadel and Quang Tri township from the US-backed army of the Republic of Vietnam. Earlier, the Party chief visited the Le Duan Political School where he emphasised the importance of political theory training to help improve political knowledge and firmness of Party members./.